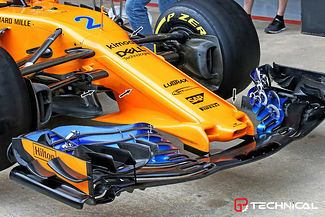 McLaren was clearly inspired by solutions seen elsewhere, with the team now implementing an open thumb nose, akin to Red Bull Racing's solution to reduce drag created by the tip of the nose. However, the new nose features another two apertures, left and right of this opened tip. Combined, they make sure the nose complies with regulatory requirements to have a low tip of the nose, while the width of the three apertures combined enables the team to move the front wing supports further apart from each other. The structure that sits downstream of the three apertures is complex, but generally speaking, it is the central thumb that forms the tip of the structural section of the nose, which is shape-wise similar to the previous design, albeit a lot narrower. It widens up just ahead of the front bulkhead connection, making it similar to Mercedes' solution, albeit with a shorter nose. Just like on the Mercedes, this exposes the upper front wishbones more to free airflow, enabling these to have an increased aerodynamic effect. The outer two inlets at the tip of the nose cone are part of an aerodynamic shape that incorporates the front wing supports. The leading edge of that section shows how much McLaren wants airflow underneath the nose, in between the front wing pillars. To control this flow, the aerodynamicists have also added a cape-like structure - thankfully all painted in orange - that mildly slopes downward. Clearly there to control airflow structures downstream, the design is similar to Mercedes' solution. The layout introduced by McLaren though makes the cape an integrated part of the nose, whereas it seems more of an add-on for the Mercedes. All these changes combined are no doubt interesting, but McLaren have also added fairings along the shoulders of the nose. This is entirely new, and seems to be designed for helping the airflow the is shed off the top of the nose to stay attached to the side surfaces of the nose cone. This flow happens on each design of nose cone, as air flows around the edges due to the lower pressure existing underneath the nose cone. It is believed these fairings can help stability under yaw. Furthermore, it should be noted that it looks like the airflow from the three openings is exited centrally, underneath the nose cone. An S-duct appears to be missing still, but apertures on the underside of the tub may still hint an introduction of such device later on. No doubt, McLaren has some airflow verification work to do, but the real question is whether all this will be better than the updates that other teams are bringing.